My wife and I were walking the dog around the block late in the afternoon yesterday and I saw that the moon was out and looking pretty nice. 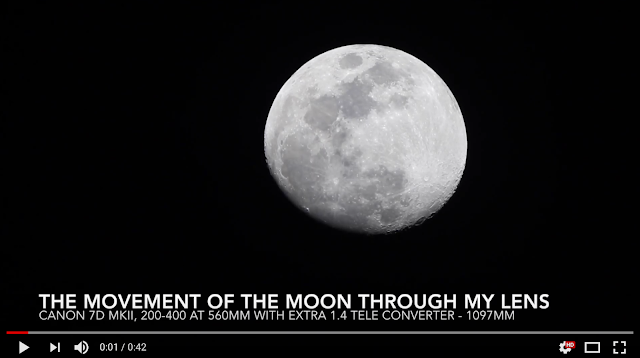 I said to my wife "I wonder if I could put a 1.4x teleconverter onto the Canon 200-400mm lens (which already has it's own 1.4x tele converter built in) and photograph the moon really close up." At which point she responded with "I have no idea what the heck you are talking about." I tried to explain it to her, but instead, got home and gave it a try. Knowing that there are certain lenses that will not work with a teleconverter, I was pleasantly surprised that the 1.4x teleconverter mounted onto the 200-400mm lens. I determined that with both teleconverters on at the same time, the lens would be at 784mm with a minimum aperture of f/8. I put on the Canon 5D Mark IV camera to take advantage of the 30 megapixels. 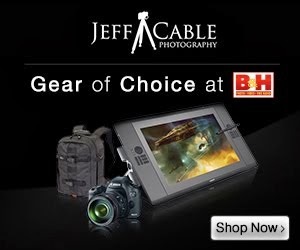 I mounted all this on my Gitzo tripod and the Acratech ball head. And yes, I did get a lot of interesting looks from my neighbors as they walked by. Look at this beast! I never get tired of looking at the moon like this. It is so awesome to be able to see the craters and different characteristics of the terrain. After taking this photo, I decided to try the same setup but this time with the Canon 7D Mark II camera. This camera has a crop sensor, which basically adds another 1.4x to the equation. Now I was shooting with a total of 1097mm. As I was taking some photos, I noticed how fast the moon was moving through the frame of the camera. I then switched to video mode. Click on the image above to head over to YouTube to see the video for yourself. 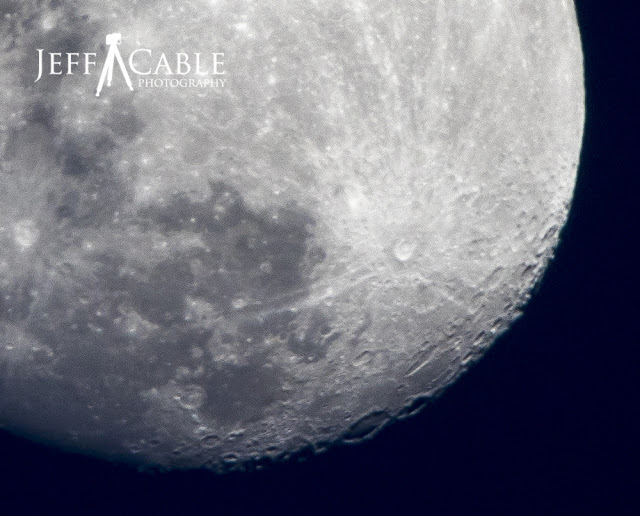 This will show you why it is impossible to take a photo of the moon with a really long shutter speed. 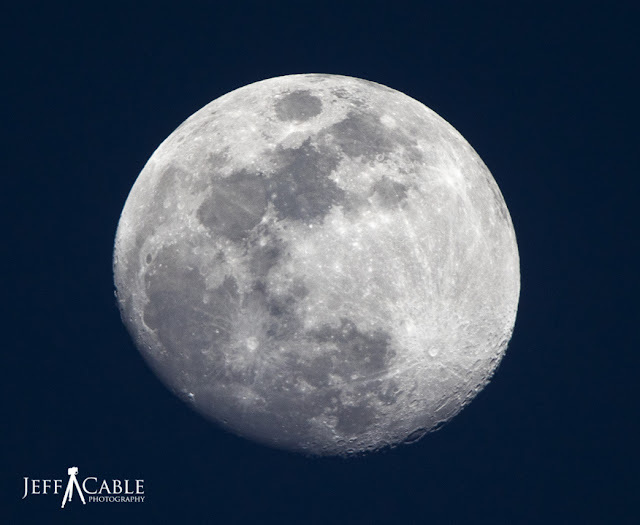 If you were to try capturing a photo of the moon (using any long zoom lens) with anything more than a one second exposure, the moon would be blurred for sure. 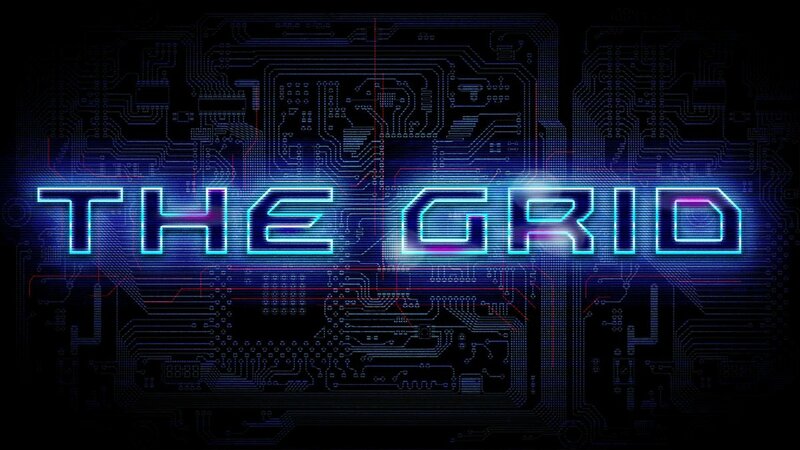 Last week I was in the Tampa, FL area for the first time ever, to join Scott Kelby live on "The Grid". It was really fun to be on the show and to share some of my Olympic stories with all of you. We went live at 4pm EST and were done by 5:30pm. Scott and I went to dinner the night before and he was busy on this evening. As I drove away from the studio I thought to myself "What should I do now?" I had the rest of the evening available and did not want to just hang out in my hotel room in Oldsmar, Florida. I looked at my iPhone and noticed that sunset was not until well after 7pm, which gave me plenty of time to find a good location for a night shot. The only problem is, when I packed for my trip back in CA I broke my own rule and decided not to pack my Gitzo travel tripod. So I needed to find a good location with some ledges or something for me to rest my camera with no movement. I brought just my Canon 5D MK IV and one lens, the Canon 24-105mm. That would have to do the trick. I got in my rental car and drove the half hour to Tampa. I drove around the coastline to see if I could find a good shooting location. I stopped and parked at the edge of (what I now know is) Hillsborough Bay. I shot some images in the late day sunlight. Definitely nothing special here! As I walked around I saw the setting sun reflecting in the Wells Fargo building and grabbed this shot. I walked across numerous bridges in search for my night shot. As I crossed this bridge, I looked and saw my long shadow on the roadway. I quickly turned and took this shot and got out of the way of oncoming traffic. I looked across the bay and figured that I would get a good view of downtown from the back side of the Tampa General Hospital. I walked over to the hospital and saw this view of the city, and the colored lights that were starting to show on the bridges and buildings. I also noticed that there were cement posts every 25 feet where I could rest the camera for long exposures. That would work just fine. I knew that these varying colors (red, green, blue...) would reflect well on the water with a long exposure. I walked up and down the pathway behind the hospital shooting images and looking at the different angles. I turned and saw the end of the sunset behind me. Having this large building right in the middle of the shot was not optimum, and a small part of me was bummed that I did not get to a good location for the actual sunset. But my decision was made and I went back and waited for the sunlight to fade, and the "blue hour" to start. I switched the camera to 2 second timer mode (so that I would not get any camera shake from hitting the shutter button) and got this first long exposure shot of the last of the pretty sunset reflecting in the Wells Fargo building. I determined that this vantage point was the most interesting, and took numerous photos from this spot. This one was taken at 35mm to include a little of the fence on the left and shows a smooth reflection in the water. I had the ISO set to 100, an aperture of f/11 and a shutter speed of 25 seconds. My last shot of the evening was taken from the same cement post, but zoomed in a little tighter to 45mm. I kept the ISO at 100, but changed the aperture to f/14 with a shutter speed of 30 seconds. Even though the exposure time was very similar to the previous photo, you will notice that the reflections are more defined in this photo. After shooting these images for an hour, I found my way back to the rental car and headed off for dinner. I had a good burger and while sitting and eating, I was content knowing that I had captured some pretty photos in a new location for my collection. Well folks, after more than 5 years of people asking me when I will be on Scott Kelby's "The Grid" show, it is finally happening. I will be live on the show tomorrow. 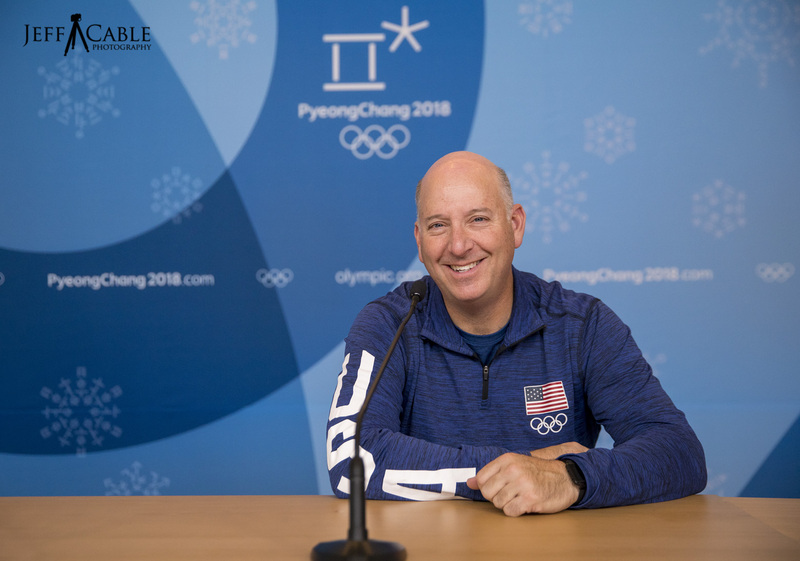 I was talking to Scott right after I returned from PyeongChang and we found a way for me to get on the show. I had another trip that was postponed, so I was able to fit this into my schedule. And here I am on a plane and heading to Tampa, FL to join Scott in the studio for his webcast. I have always admired Scott and the way that he teaches photography and Photoshop, and I am honored to finally be joining him for this show. Join in tomorrow to watch the show and ask any questions you might have! 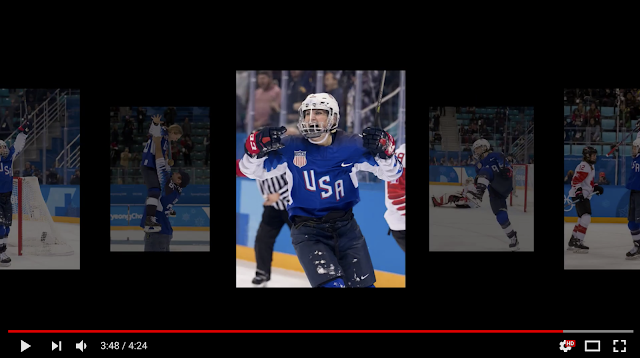 A video of favorite photos from the 2018 Winter Olympics! As I have done for the last 5 Olympics, I am posting a compilation video showing many of my favorite photos from these Olympics. The good people at Photodex have helped me take all the images and put them into a cool 4 minute video, using their ProShow software. To see this in the best resolution, click on the image above or HERE and watch it in full screen. I have been home from the Olympics for a week now, and yesterday was the first day that I felt like I was back to normal, well...as normal as I ever am. During the last week I have had time to digest the madness of the last month and wanted to share with you my recap of these Olympic Games. 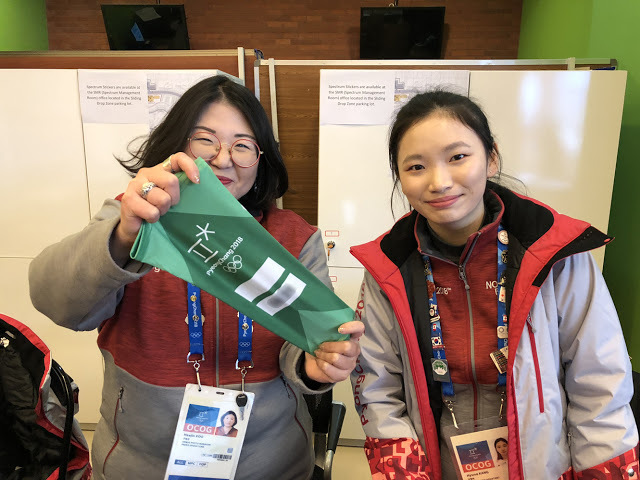 The toughest day: As most of you can guess, the toughest day of these Olympics was the day that my roommate lost my green sleeve. That was such a frustrating day, but ended being a good story to bring home and we can all laugh about it now. 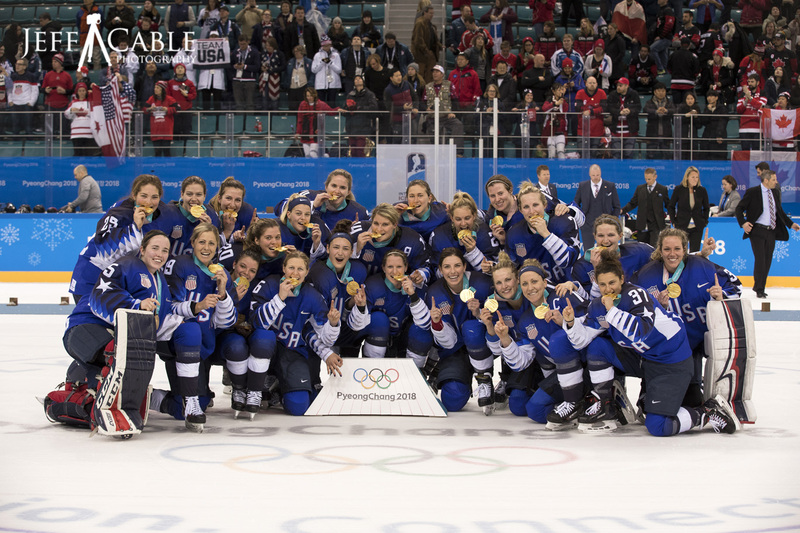 The best day: For these Olympics, the best was the day that the women of USA Hockey won the gold medal in an overtime shootout. It was an amazing match and something I wanted more than anything else at these Games. Not only was it fun to capture this for the team, but it was fun to spend the evening with them at the Today Show and the next day as they basked in the glory of the gold. Oh, and getting the upcoming cover of USA Hockey Magazine is pretty cool too! My biggest frustration: Due to the schedule and proximity of venues, I never had a chance to see any snowboarding, skiing or any of the aerial sports. I never even had a chance to visit the Phoenix Snow Park which was located about an hour a half from where I was staying. Not having visited this area at all has left a hole in my Olympic experience. The biggest difference from other Olympics: As I look back at these Olympic Games, I have to say that the Korean people made the biggest impression on me. These people were absolutely amazing, and always willing to do whatever they could to help us out. As opposed to the last two Olympics (Sochi and Rio), these Games were way more organized and the people were so much easier to deal with. The biggest surprise: Having been to Asia many times, I know how good the Internet is in this region. I was expecting super fast Internet speeds and amazing connectivity at these Games. I was let down with only 20% of the press buses having working WiFi and many of the venues where the WiFi just flat out didn't work. I succinctly remember the women's gold medal game where the WiFi was either jammed with media trying to post or just not working. But either way, I sat there at ice level and tried to post to the team and could not. I thought that my contact at USA Hockey was going to kill me, except that when I texted him about the issues, he said that he could not even post a tweet. At the end of the second period I had to resort to "sneakernet" and met him in the mix zone for a handover of my USB drive to get him images. My biggest reminder: Since my return from PyeongChang, I keep telling my photographer friends, "If you think you are a good photographer - go to the Olympics". Every time I come back from shooting the Olympics, and seeing the work from so many amazing photographers, it is a humbling experience. I look at my images and wonder if I belong there. Seriously! My biggest challenge: Now that I have photographed 6 Olympics, it gets harder and harder for me to create images that stand out. At these Olympics, I was pushing myself to shoot more artistically (when I could), but having shot many of these sports before, it is hard to do something different. At past Olympics, I would motion pan at 1/40th second. So this time I tried pushing myself to get good images at 1/20 sec, 1/10 sec or even slower shutter speeds. I actually had a second challenge, and that was shooting in really cold temperatures. Being a California boy who does not deal with snow or really cold temperatures, there were times when it was tough for me to tackle the really cold weather and winds. 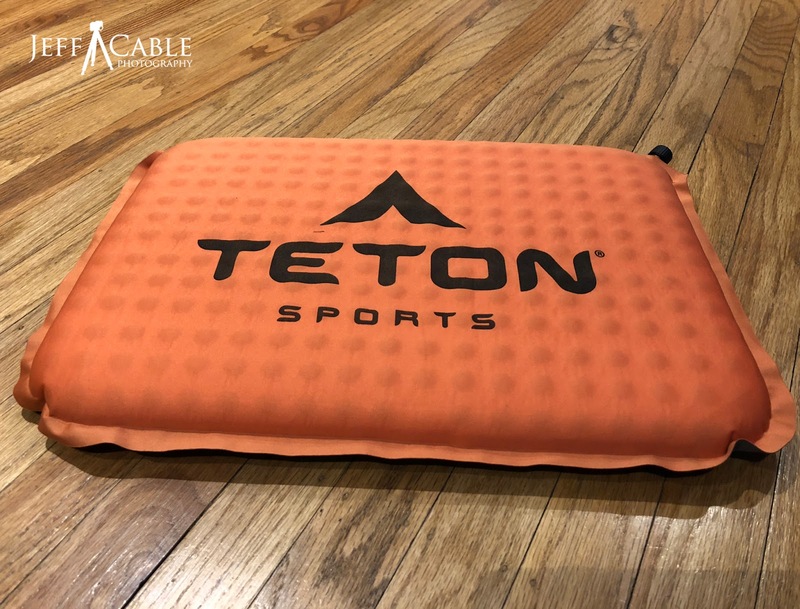 My favorite accessory (not camera related): After dealing with a sore back at the last couple of Olympics, I decided to bring an inflatable seat cushion. My wife found this amazing Teton ComfortLite cushion that was a lifesaver! We are constantly sitting on metal seats, wood risers or hard plastic seats when we are shooting, and having this seat cushion was awesome. I can not tell you how many photographers looked at it and wished they had one. My biggest appreciation: There are so many people that supported my along the way. Most of all my wife and kids who basically lose their spouse and father for a month every two years. I appreciate the fact that they put up with my frantic self in the months leading up to the Games, then share in the experience from afar, and finally have to deal with the after effects of the Olympics on me when I return. And I could not have captured all the images without the amazing support of Canon. They not only leant me the cameras and lenses, but were there to service my Canon products throughout the Games, as I bang them around and put them through their tests. And then I have Manfrotto who furnished me with their newest monopods, Tiffen who made sure I had enough of their awesome filters, Drobo who helps me keep all this data secure, Zenfolio where I post everything on the web, and Photodex who is helping me create a cool video of my favorite images. All of you are amazing! Each Olympic Games ends with the closing ceremony, which is a combination of pageantry and party. Although many photographers choose to skip this due to exhaustion or lack of interest, I like attending this event, as it is usually fun to photograph and a fitting end to a really long month. Luckily, the evening of the closing ceremony was 20 degrees (F) warmer than the opening ceremony. As I did for the opening ceremony, I had two cameras with me. 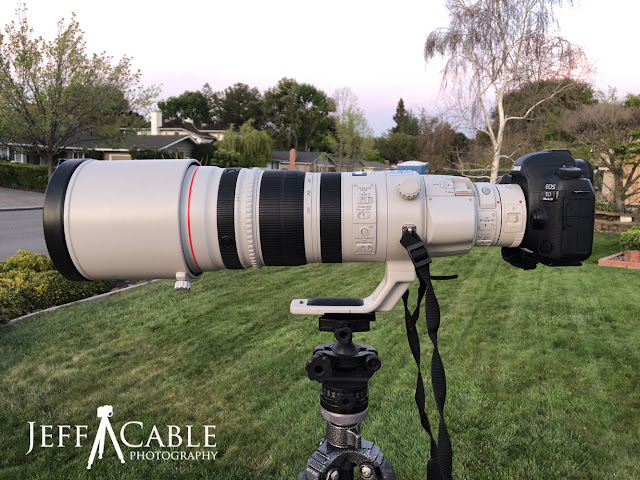 I had one Canon 1D X MK II with the Canon 200-400mm lens on my Gitzo monopod for the zoom shots, and my Canon 5D MK IV with a Canon 24-70mm lens for the wide shots. This photo was taken with the 5D and wide lens to capture the beginning of the festivities. For all the tight shots, like these kids on inline skates, I relied on the Canon 1D and long lens to get in close to the action. Every time they would blow off fireworks, I would quickly grab the Canon 5D for the wide shot. In the 5pm photographer's meeting, they told us the agenda of the show and gave us some ideas of when certain events would happen. This was the arrival of the Korean flag. It is tough to shoot this event since there are so many things happening at one time. I might be keying in on a certain subject only to look up and see that these guys were performing on this ramp. These ladies were dancing in front of my position and I saw that, at certain times, the light would hit just one of the lady's faces. I waited for that moment and fired off my shot. I like the way that this would highlight just one of them and separate them from the rest, giving the viewer a place to focus their attention. ...and then quickly rolled my ISO down to 200 to give me a shutter speed of only 1/5 sec. I waited for a moment when she was not moving at all and took a couple of shots. This froze her and showed motion in everyone around her. I have used this same technique at the last 3 closing ceremonies of the Olympics, when the opportunity presents itself. I was shooting the slow shutter shots of the lady (holding the camera as steady as I could) when I looked up from the eyepiece and saw this. I quickly grabbed the other camera and got my wide shot. Then it was time for the athletes to enter the stadium. Unlike the opening ceremony, all the flag bearers come in together and the athletes follow in mass. As the athletes were coming into the stadium, I was looking for key people or interesting moments. I saw this French woman and laughed and she and the Korean women entered the ceremony in style. Since I shoot for the American team, I always grab lots of shots of them coming in. I saw Madison Chock coming in with Evan Bates and grabbed some shots for them. I met them at the Today Show a couple of days before and had sent Madison some photos. I thought she would enjoy this shot (which I sent to her yesterday). I loved this reaction from Lindsey Vonn as she was carried in, and sent this to her as well. Here is the crazy thing. Most of these athletes do not get photos of themselves at the Olympics. Almost all the photos are taken by agencies, and they do not offer them to the athletes, only to publications. I always share my photos (for free) to the athletes. This was another historic moment as the North and South Koreans came in together. Just after the athletes finished entering the stadium, Intel impressed everyone with their drone light show. Because I was still focusing on the athletes, I almost did not see this! As someone who owns and flies a drone, this formation of over 1000 drones just amazes me. The Korean's were very creative with the animal art forms. I was able to freeze the action in this shot since I timed the photo right at the pinnacle of her jump. I love taking advantage of the creative lighting of these ceremonies. I had no idea who this performer was (she goes by CL), but had fun shooting the photos anyways. Towards the end of the ceremony, they take down the Olympic flag, which is always a bitter sweet moment for me, as I see another Olympics come to a close. It is bitter sweet because it is ending, but also because I am exhausted at this point and ready to go home and see my family and friends. They passed the Olympic flag to Beijing (who is hosting the next Winter Olympics) and performers from China put on this cool show with panda bears and cool light panels. I am sure that the Opening Ceremony in four years will be amazing. I believe it will be back in the Birds Nest where the 2008 Summer Games were opened and closed. That was my first Olympics, and it will be weird to be back there again 12 years later to do it all again. Awesome colors on the floor. Many of the stars from current and past Olympics, including the shirtless Tongan cross-country skier pose for a photo with Thomas Bach (President of the IOC). I got a good chuckle when photographing the Korean-Chinese boy band called EXO. It seemed to me that all boy bands look, dance and sound the same, no matter what country they come from. The Korean girls who were standing behind me were screaming at the top of their lungs, so I guess that is the same everywhere as well. A giant box came out and opened to reveal this snow globe. I saw these ladies standing and holding the snow globes and saw how the light was shining on their faces. I love the lighting of this photo. The snowflakes went up to the Olympic Flame and then is was extinguished. The 2018 Winter Olympics were now officially over. They brought out some more props and invited the athletes to come onto the floor to dance. At that point, I quickly packed up my gear and made my exit out of the stadium. I have done this enough times to know that if I make the first press bus I can get out quickly. If not, it can takes hours to get back to the Main Press Center or the Media Village. I ran for the press bus with all of my gear, and turned around to see the fireworks being launched behind me. Right as I approached the bus stop, I dropped all my gear down, grabbed my Canon 5D MK IV and shot these photos from the exterior of the stadium. The funny thing is, this was not a planned shot, but something I had tried before and never succeeded in getting. You have to move really fast to get the closing inside shots and the external fireworks photos. I was able to capture these and then as soon as the fireworks ended, I tossed my camera back in the backpack and hopped on the bus. Two minutes later we were rolling out of there.